This is a second chance romance that will tug at your heartstrings. Cleo Delaney and Judd Laramie have a history. Cleo is in a tough spot and needs Judd’s help in fostering three boys. Unfortunately, Cleo has a few strikes against her so she can’t foster her friend’s boys. Judd also has an issue that he has to work through as well. Cleo, Judd and Judd’s family work very hard to keep the boys despite all of the obstacles facing them. This story touches on many issues as well; alcoholism, foster care, child abuse, mistakes made in youth, and adoption. Ms Fossen touches on all of these topics throughout the story. She also shows that there is room for forgiveness in order to achieve your happily ever after. Enjoyed this story. There are few authors who can get me as enamored with a story as Delores Fossen does with her excellent, engaging storytelling talent and her way to use the English language. 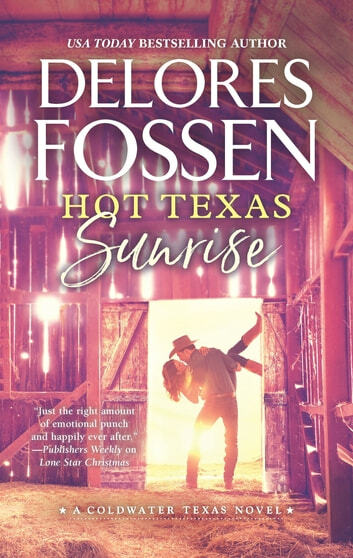 And Hot Texas Sunrise -- I just loved it, every word, scene and moment of it as I was simultaneously sobbing, laughing, swooning and falling in love. Prepare yourself for an emotional ride that will pull all the feels into the surface. Even with the mighty serious subjects of child neglect, abuse, and foster care challenges, and alcoholism, through the tale, there is a tiny line of hope following each challenge that the life throws at the brothers. There is that faith that things will turn better, that everything will work out, as long as we stick together and have each other's back. And that they do. They might have shown some tough love at times, but they are always there for each other. Judd Laramie was so delightfully easy to fall for, completely. His humble kindness, his sense of humor, his way to look at life and the people he interacts with, he won me over from the start, no doubt about it. He struggles with his demons from his challenging childhood, yet he is honest about them and doesn't hide behind the troubles, but is trying to move forward. Cleo Delaney is a feisty, spirited, determined, and brave, a true heroine doing her best to save the kids of a friend who passed away. Her passion for life and everything she engages with is admirable and fiery, as she gives her all every waking moment. The connection between Cleo and Judd goes all the way to their teenage years, as does the burning chemistry between them, the attraction that has been there for always. It is a tangible force, that takes off like a hurricane, and there is nothing they can do to stop it, so they just enjoy the ride (the pun intended.) Hot Texas Sunrise is a story of survival, a family of heart, the strong bonds of brothers, and about resurrection and love. It is a tangled mess, it is fervent and intense. It has such hilarious unexpected humor in the most serious situations, and it has the feels, all the emotions on the surface as the story unfolds. I savored each moment of the tale, pacing myself, so I could catch each nuance and twist, take pleasure in a story while getting to know Judd and Cleo, and the whole wanton bunch at the Coldwater ranch. ~ Five Spoons! Hot Texas Sunrise is a lighthearted, second-chance romance between the dedicated, selfless Cleo who’s determined to do whatever it takes to protect her best friend’s orphaned children and the conscientious, handsome Judd who’s got enough on his plate just battling his own demons from the past. The prose is smooth and fluid. The characters are engaging, scarred, well-drawn, and endearing. And the plot is an affecting tale full of family, secrets, abuse, deception, hilarious hijinks, witty banter, palpable chemistry, steamy romance, as well as a little insight into the limitations, deficiencies, maltreatment, neglect, and odd success story of the foster care system. Overall, Hot Texas Sunrise is a warm, charming, entertaining read that I feel has just the right amount of emotion, angst, drama, passion, and cowboys to make this an excellent choice for those who love contemporary, western romance.